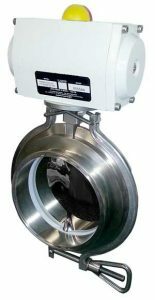 Butterfly Valves set the standard for the handing of powders, granules, pastes, liquids, and gases in the hygiene conscious industries. They are able to seal against pressure or vacuum and offer superior quality coupled with the latest design and technology available for a single vane valve. 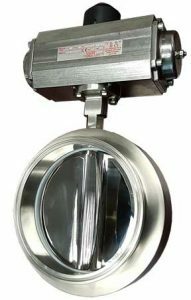 The butterfly valve has a wafer style design to keep a seal against differential pressures above and below in order to prevent any backflow and allow for single direction flow. It achieves this by using a tightly fit seal (available in a variety of materials) against the sides of the flat valve vane. Rotary Valves allow for continuous feeding of powders or granules without flow obstruction. 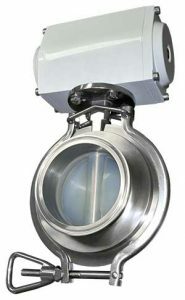 Its use is ideal for the accurate feeding of any vessel or process in a batch system. 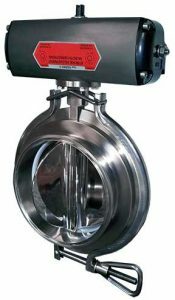 The valve’s unique design provides a precise flow control system in far less space due to the fact that its dimensions are smaller than conventional star valves. This valve has been developed to provide uniform dosing of product. Its star configuration and its movement (rotating back and forth over 180 degrees) supply product into the vessel below while keeping the product above contained in the feeding receiver. The reciprocating movement prevents separation and can be regulated as required. With the proper controls, the Rotary Valve can be used as an extremely accurate batch feeder. Tablet Valves offer an ideal solution for handling capsules, tablets, pills, or any small, fragile product. Its silicone coated, flexible disc allows opening and closing of the valve without any damage to the product. A Tablet Rotary Valve is also available. The silicone is of medical grade material based on the standards of Pharmacopeia FDA 21 CFR 177.2600. In lieu of, or in addition to, our standard valves is our custom, tubular Vibratory Feeder. Specially designed to feed product horizontally from a discharge hopper to the receiving container, our vibratory feeder is a simple, safe, and inexpensive choice for getting a controlled feed. The tubular tray and vibratory drive motor can be designed from small to large to accommodate nearly any project specific requirements.